Originally brewed as Generation to celebrate the birth of the sixth generation of the founder of the company. 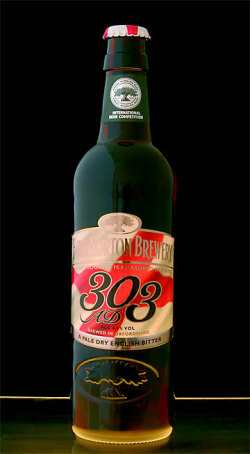 Name changed to 303AD in Spring 2005 to celebrate St George, patron saint of England, who died in 303AD. "A pale dry bitter, predominantly hoppy with hints of citrus and ginger. Brewed with proportions of Amber Malt, it is our only beer to use dwarf hop variety First Gold." Tried on St George’s day. Excellent beer from Hook Norton, bitter refreshing and tasty. Bottle (in NZ). A slight haze, but a very nice golden amber pour. A white head that didn’t hang around. The aroma didn’t pack much, but the palate is full juicy malt, with a good hop bitterness and a touch of citrus coming over the top of that. This is my type of beer. 0.5 l bottle. 4 months past best before date. hazy orange-copper,thin white head. aroma doesn’t please me much, but the flavor all the contrary. syropy sweet fresh flavor. Double the freshness in flavor. but the bitterness is damn good in this beer. malty after taste, ginger I found after I read the description. Buttery eukalyptus in mouth in the end. A nice amber color and a moderate head. The aroma is has notes of aroma hops and malt, the flavour is full. I sense roasted malt, caramel, fruit and quite a bit of citrus towards the end, with a tendency to get a bit to grapefruit like. It’s a nice and fresh beer with good points. A nice looking golden brown color with a finger width of filmy white head that stuck with the glass until the last swallow. The aroma was distinctly hoppy, but not much less to say: very ho-hum. In the mouth I did notice the bubbly texture, but I was overwhelmed by the bitterness that dwarfed any other flavor. The finish washed down smoothly, but the bitterness of the aftertaste lingered on the palette too long for my preference. Someone who was more into this style of beer would probably be ga-ga over this Hook Norton offering, but for me this was just overly one-dimensional. Nice hoppy exuberence but a bit one sided as far as flavorings. It does almost have a malty cigar-like backdrop to it. The texture could be a bit more refined. The flavor could be a more balanced out as well. Bottle. Deep golden with a creamy offwhite head. Fruity hop aroma and hints of toffee. Toffee and raisins flavours, challenged by refreshing citrus. Good bitterness. Medium body. Nice.